Coro siamo, (Italian for ‘We are a choir‘) was founded by Florian Maierl in 2006 in Vienna. The choir consists of 40 young choristers who are enthusiastic about performing high-level vocal music as a homogeneous ensemble. Our repertoire spans from Italian Madrigals and early Baroque passion music, through compositions of the Classic and the Romantic period, to the works of contemporary composers and vocal jazz. The ensemble frequently performs at the Vienna Votive Church and at St. Stephen’s as well as in renowned churches in and around Linz in Upper Austria. A special focus lies on the presentation of high quality a-cappella music. For example, our repertoire comprises Allegri‘s Miserere mei as well as Bruckner’s divine motets or newest pieces by the Viennese composer Wolfgang Sauseng. However, also classics of the repertoire for choir, orchestra, and voice soloists have been performed successfully, such as the Baroque opera Dido and Aeneas by Henry Purcell, Bach’s Jesu, meine Freude, parts of Handel’s Messiah, Mozart’s Requiem, and masses of the Viennese Classic period. Another trademark of coro siamo is intercultural exchange through choral music. In 2008, the group travelled to France and performed concerts with the Parisian Ensemble Bergamasque. A cooperation with the Finnish Addictio chamber choir resulted in projects in Vienna, Pregarten, Helsinki and Tallinn. Our choristers come from different parts of Austria, from Germany, Portugal, Estonia, France, and Argentina. In 2012, coro siamo was awarded Second Prize with distinction at the ‘Austria Cantat’ choral competition in Salzburg. One year later, the ensemble won the ‘Mixed Choir’ category in the 4th International Anton Bruckner Choir Competition in Linz and was awarded a special price for their outstanding performance of Anton Bruckner’s Christus factus est. 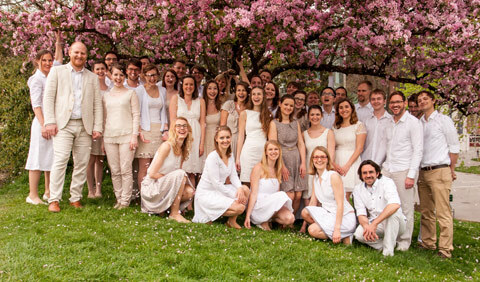 In April 2014, the choir succeeded in the ‘Österreich singt’ competition in the Salzburg Mozarteum. Being the winner out of 16 national choirs and ensembles, coro siamo represented Austria at the ‘Europe sings’ opening ceremony of the Wiener Festwochen. In May, coro siamo was awarded Second Prize at the ‘Ave Verum’ international choir competition in Baden. A choir – perhaps the most amazing of all instruments! Aside from being a choirmaster, composer, and singer, Florian Maierl teaches at the Vienna Diocesan Conservatory for Church Music. Furthermore, he is precentor and organist at the Vienna Votivkirche as well as artistic assistant at the Wiener Singakademie. Born in 1985 in Leoben, Florian received his first lessons in piano, organ, and choral conducting in Neuhofen/Krems from Welfhard Lauber. In 2003, he was awarded First Prize for composition at the ‘Prima la Musica’ competition in Upper Austria. In 2003, Maierl took up his studies in Church Music at the Vienna University for Music and Performing Arts (Choral Conducting: Erwin Ortner and Ingrun Fußenegger; Composition: Wolfgang Sauseng). In 2006, he founded the mixed choir, coro siamo which he has directed in a series of successful concerts in Austria and abroad. In 2008/09, a student mobility programme led Maierl to Helsinki, Finland, where he sought to refine his choral conducting skills with Matti Hyökki at the Sibelius Academy. Furthermore, he attended several master classes with renowned choirmasters such as Erwin Ortner, Johannes Prinz, Johannes Hiemetsberger, Volker Hempfling, Robert Sund, Jing Ling Tam and Veli-Markus Tapio. In 2010, Maierl graduated with honours – first performing his church opera “Ruut”. 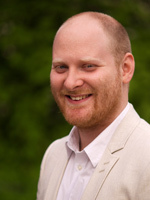 Since 2009, Florian Maierl has been studying Voice and Vocal Pedagogy (Julia Bauer-Huppmann) at the Vienna University for Music and Performing Arts. As a singer, Maierl has been part oft various national and international ensembles, such as the Arnold Schoenberg Choir, Chorus sine nomine, Vienna Chamber Choir, Helsinki Chamber Choir and the World Youth Choir. Compositions and settings by Maierl have been performed by the Vienna Chamber Choir, the Graz University Chamber Choir, the Upper Austria Youth Choir, and the LALÁ Ensemble. In March 2014, Maierl first performed his Mass for mixed choir a-cappella at the Vienna St. Stephen’s cathedral.